I made today's card just for fun! 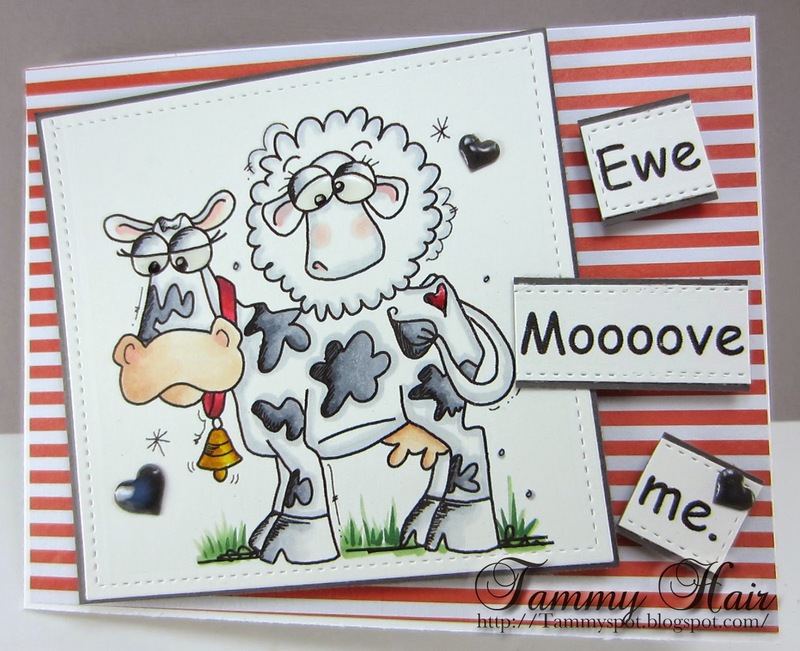 The image is from Bugaboo Stamps and is called You Move Me (ewe moooove me). The weatherman says possible snow flurries tonight so I needed to laugh. Personally, I think it should be illegal for it to snow when the calendar says spring! Oh what a fun, fabulous card. What an adorable card! I love that cow! Super cute card and I like that red stripe paper. Yep, it should be illegal to snow when it's offically spring. I have 4" of the white stuff outside now! What a great card Tammy..fab fun image and sentiment..sending you sunshine if that is possible..Winter is always the longest season and that's where I'm heading now..
Fabulous card Tammy. I love the fun image and brilliant sentiment. Great card Tammy, such fun! Such a cute image, and I haven't seen it before. Super card! Hopefully the weather man is just pulling your leg. Ack! That's the cutest thing! Love the critters and the sentiment slays me! Very fun with the red stripes. Bright, clean, and cheerful! I'll keep my fingers crossed for your snow to melt away in the warm spring sunshine. What a fabulous card Tammy! Awesome image and awesome design. Puts a smile on my face every time I come by here.. This barnyard pair is delightful, Tammy! Precious card! The coldest day I have experienced was in late April in 1977. I thought I was going to freeze to death. Our air conditioner is usually on around the clock by now. So far it has not been turned on. If we can keep both the heater and the air conditioner off this month, I will have extra bucks for my craft budget! Gorgeous card Tammy, I like everything about it!! This is so cute! Love the sentiment too. Can't believe y'all might have more snow, although it is supposed to get in the 20's at night here over the weekend. What a fun card! Love the punny sentiment! Lol! Love it! Great image & a brilliant sentiment!